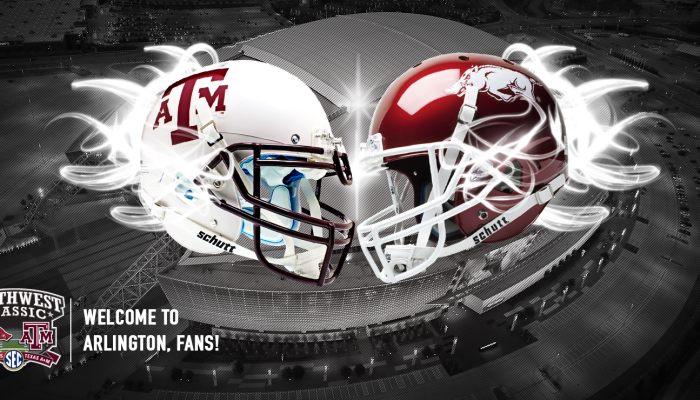 The thrills, spills, and drama of a legendary college football matchup return once again to Arlington when the Aggies face off with Arkansas in the Southwest Classic. When: Saturday at 8 p.m. See the website for ticket info. Six Flags Over Texas turns spooky at the opening weekend of the biggest Halloween party in North Texas. Be afraid, be very afraid —and be there. When: Saturday from 10:30 a.m. to midnight; Sunday from 11 a.m. to 9 p.m. See the website for Fright Fest ticket info. Why is food so much more fun when it comes from a truck? We don’t know, but we love revisiting the subject every spring and fall when Food Truck Fridays roll into Arlington. This year’s kickoff event will celebrate our sister German city, Bad Königshofen, with a festive lineup of German-themed food, beverages, and music. When: Friday, 5-10 p.m. Admission: Free (does not include food purchase). More. A steak cook-off, kids’ zone, craft beer, and tons of live entertainment are the main attractions at this hometown favorite festival celebrating one of Arlington’s oldest and most charming suburbs. When: Saturday from 10 a.m. to 11 p.m. Admission: No charge to show up and walk around, but tickets are required for the steak dinner, evening concert, and other attractions. Take a time machine back to Arlington’s pioneer days at the Front Street Festival, where you can check out vendors, artists and historical reenactments, tour log cabins, and a one-room schoolhouse, and witness some honest-to-goodness blacksmithing. When: Saturday, 10 a.m. to 3 p.m. Admission: $3.00 (except for kids 13 and under, who can join the fun for free). Conceived in 1999 as a celebratory exhibition of Lubbock art and music, this semi-regular show has gradually evolved into a wider presentation of prominent contemporary artists who live in or maintain strong ties to Texas. It’s called a “must-see” for anyone who digs contemporary art. When: Friday and Saturday from 10 a.m. to 5 p.m. and Sundays from 1 pm. to 5 p.m. Admission: $8 (discounts for seniors and kids). More. This colorful portrait of a loveable group of Damon Runyan-esuqe underworld figures will have you talking like a 30s-era gangster, joining the Salvation Army, and singing the classic, catchy tunes for weeks to come. When: Friday and Saturday at 8 p.m., Sunday at 2 p.m. Tickets: $25 (with discounts for students and seniors). Does it get any better than music on the lawn on a lovely autumn evening? Head to the Levitt this weekend to catch the likes of The Killdares, Shel, and Jimmy Cobb and the UTA Jazz Orchestra; or: Want to kick off your weekend a little early? Check out the special Thursday night concert featuring Luke Wade of “The Voice” fame. It’s sure to be a crowd-pleaser. When: Thursday-Sunday at 8 p.m. Cost: Free (Restaurant vendors on-site, or you can BYO food and beverage). More. Full of oh-no-you-didn’t moments and steeped in fun, Maverick Theatre Company’s “Flight 12 Improv” has a style that’s always outrageous and never stale. When: Friday and Saturday at 8 p.m. Tickets: $5.00. Performance Experience and Legal Draft Brewing Company have teamed up to bring you a unique Sunday morning experience that pairs low-impact, meditative yoga with beer flights. Now, why didn’t we think of that? When: Sunday at 10:30 a.m. Bring your own mat and gear.